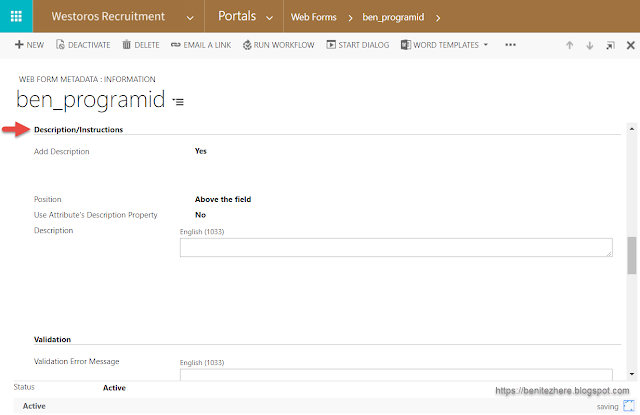 End user experience for Dynamics Portals is key for making Dynamics Portals feel less like Dynamics 365 and more like an actual portal. Errr, does this makes sense? Hopefully it does. 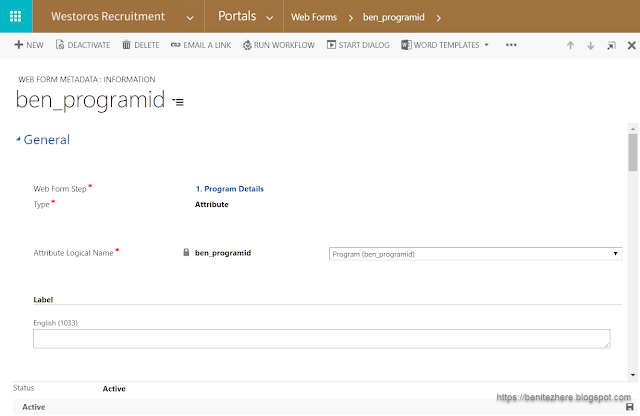 One of the end user experiences that can be changed in a supported manner is the display of a Lookup field in Dynamics Portals. When you configure an Entity Form or a Web Form Step that has a Lookup field, it behaves like the following. If I only see eight values, why can't I just select it in two clicks? Why do I have to see this pop up window and then select the value from this list? Oh... what does this search field do? Exactly. 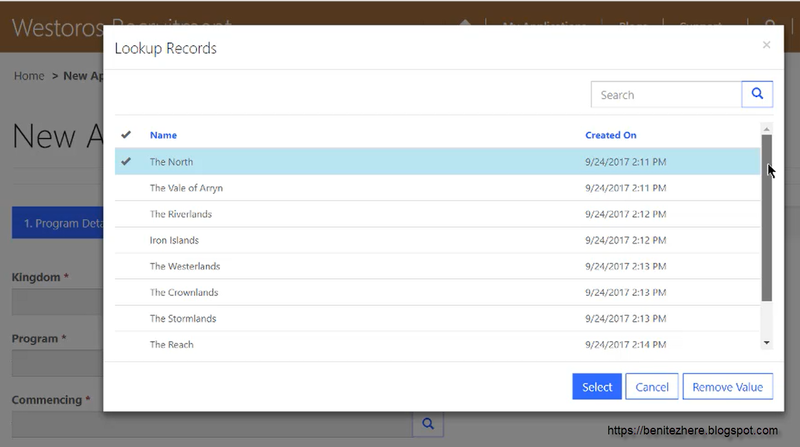 By default since there is a Lookup field on the Entity Form or Web Form Step, it will behave similar to the Dynamics 365 out-of-the-box functionality of a Lookup field. As a Dynamics 365 user you would be familiar with this layout. As a Dynamics Portals end user this would be unfamiliar. 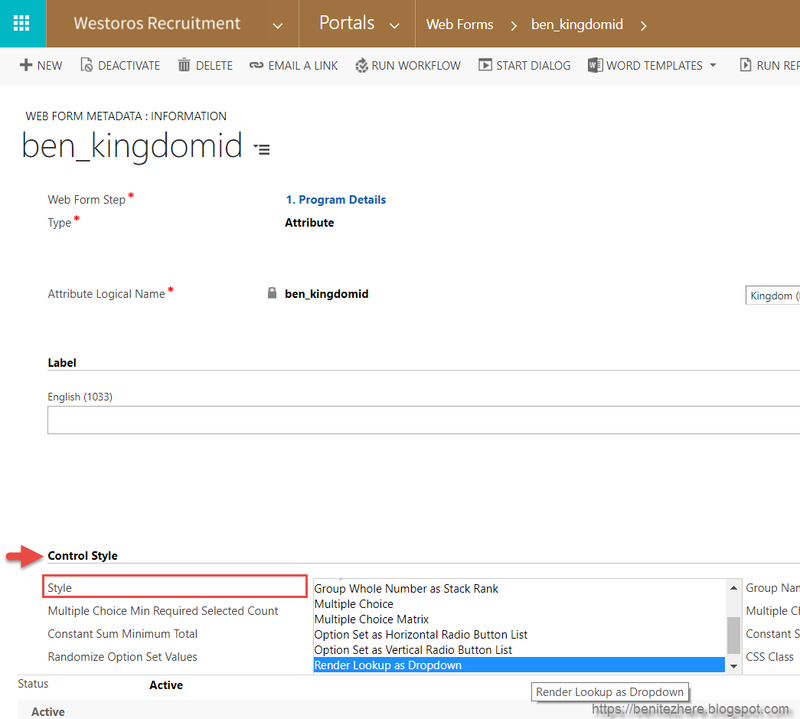 The Lookup functionality for Dynamics Portals is valid when there's a large volume of records/information for an end user to select but when there is only a few to select from, it's over kill to display the Lookup. Keep it simple for the end user. What can you do to make this end user experience better? Take a look at my vlog to learn more. Yeah, it's my favourite. You would have guessed it from my previous vlogs as I've shared a couple of tricks with Web Form Metadata. In the Control Style section, there is a field called "Style." In this field there is an option you can select called "Render Lookup as Dropdown." Select this option and away you go. If you are using Filtered Lookups in your Dynamics Portals Entity Form or Web Form Step I'm afraid this option is not valid. The field in Dynamics Portals will display all values instead of conforming to the Dynamics 365 behaviour of Filtered Lookups. 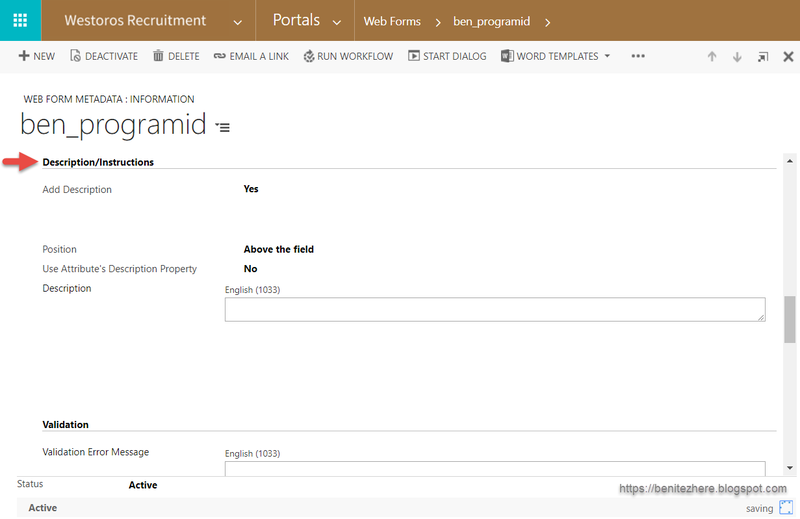 By using Web Form Metadata you can change how an end user interacts with a Dynamics 365 lookup field by displaying it as as a dropdown field in Dynamics Portals. You're keeping the end user experience simple in the scenario where there isn't a large volume of values (records) to select. 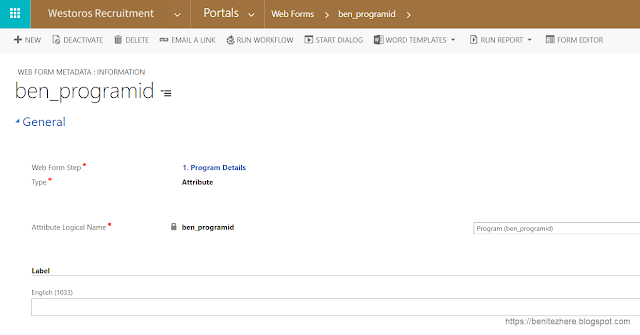 Dynamics Portals surfaces Dynamics 365 entity forms that are linked to a Dynamics Portals Entity Form or Web Form Step. Whatever you configure in the Dynamics 365 entity form will show on Dynamics Portals. Therefore you are abiding to the Dynamics 365 configuration principles. By default the field label in Dynamics 365 fields is limited to 100 characters including spaces. This is true however as seen in my previous vlog, there's some nifty tricks you can do with Dynamics Portals. This time round I'm sharing with you all on how you can increase the field label length in Dynamics Portals without being in conflict of the Dynamics 365 field label limit of 100 characters. Web Form Metadata! 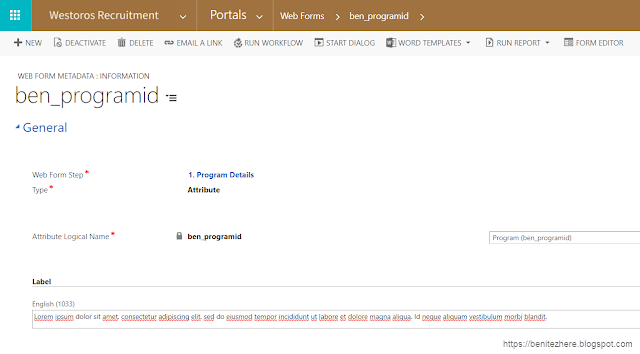 I love this feature of Dynamics Portals. There's different things you can do by applying Web Form Metadata to a Dynamics Portals Entity Form or Web Form Step. In the "Label" section this is where you can insert your long field label that is beyond the 100 character limit. Once you update the value for the Dynamics 365 field using the Web Form Metadata, the text entered will appear in Dynamics Portals. You won't cross paths with the default Dynamics 365 behaviour of the 100 characters limit in field labels. Web Form Metadata will allow the length of a field label to be increased for a Dynamics Portals Entity Form or a Web Form Step. You simply select the field that needs to have an increased field label and away you go!!! Awesome sauce. Ever wanted to display helper text in Dynamics Portals with a hyperlink to either a document stored online or to a different web page that may list the terms and conditions to users? I didn't know the official terminology until I Googled it one day and sure enough I found a website with design guidelines that described what I was looking for as "helper text." It's text that is usually displayed by a field to help the user understand what they need to enter in the field. Can I do this in Dynamics Portals? You most certainly can my grasshopper. There's no need to use content snippets and then modifying the template for the form to display the content snippet by the field. Well you could but it's more time consuming and general rule of thumb is to work with what's available out-of-the-box if you can. In my vlog I show you how to achieve displaying a clickable hyperlink to a user in Dynamics Portals. Create a Web Form Metadata record against the Entity Form or Web Form Step that is displaying the fields to the user in Dynamics Portals. You want to select "Attribute" as the Type value. Then proceed in selecting the field for the helper text. Scroll down till you see the Description/Instructions section. The Position field outlines where the helper text is going to display against the field. I personally like "Above the field" as it looks better than the other two options. The Use Attribute's Description Property field should be set to No otherwise it will use the description entered in the field in the field customization settings. The Description is where you enter in your text. If you enter in text, that's fine. Your text will show as required. A more common scenario is providing a hyperlink for the Dynamics Portals users to click on for additional information that cannot be displayed on the form. An example is a link to terms and conditions. If you want to enter in a hyperlink for users to click on, simply use HTML to do so. Click <a href="https://docs.microsoft.com/en-au/dynamics365/">here</a> for full terms and conditions. When you refresh your web page of the form, you'll see the helper text displayed. If you use this HTML it will open the target URL in the current browser tab which is not ideal as the user needs to remain in the Dynamics Portals form. Click <a href="https://docs.microsoft.com/en-au/dynamics365/" target="_blank">here</a> for full terms and conditions. Quick question - how come this Dynamics 365 field supports HTML? If you look closely at the field, it's not actually a standard Dynamics 365 field. 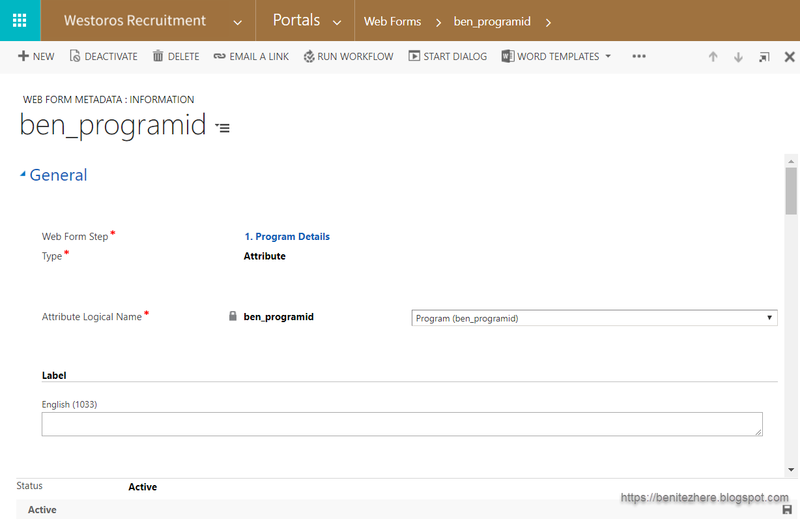 Our friends at Dynamics Portals have used iframes in some of the records to allow more functionality beyond a standard Dynamics 365 field. Now you do need to be practical about what you display. GIF, ASCII Art or Marquees is probably not appropriate (well in a live/production environment ;) ). You get the idea though, if you know HTML you can manipulate the appearance of what's entered as helper text. I'm not a HTML guru, I had Google help me with some of the HTML above. Marquee was a personal favourite of mine when I learnt simple HTML back in high school ages ago so it made the cut. Displaying helper text is supported and 100% configurable using a Web Form Metadata record of type "attribute." You don't need to do any additional development to provide this functionality, it's supported with Dynamics Portals already. I hope you enjoyed the vlog. I had a lot of fun with it.